While writing is thought by the Chinese to communicate, perhaps better than any other art form, the cultural values and circumstances of its maker, calligraphy seems to be one of the more remote and inaccessible arts to the outsider who does not read Chinese. Here are a few simple characters and their meanings. As you look at the various examples throughout this unit, try to find them and compare how they are written. Da4, meaning "big" or "great"
Zi3, meaning "son," "child," or used as the pronoun "you"
Zhi1, used as a possessive or as the verb "to go"
Written records hold a significant place in China's history. The earliest surviving examples, from the Shang capital of Anyang, date to the thirteenth and fourteenth centuries BC. These oracle bone records were divination results inscribed on turtle shells and shoulder blades of oxen. What was the purpose of this kind of written record? What factors do you think influenced the form writing took at this time? Oracle bone scripts were first written with a brush, then inscribed with a stylus or animal bone tool. Do you think this type of writing would have been considered easy to read? Since Shang times Chinese has been written not with an alphabet-based script of the sort we are used to, but one with a symbol ("character") for each word. Many characters are made up of components, some of which can also stand on their own. Often characters can be broken down into two major parts, one which indicates the general meaning of the word, and one which indicates the sound. The character gong4, meaning to offer or provide, has the "person" character in red functioning as a semantic classifier (indicating meaning). Each character is formed by a set number of marks, or strokes, made by the brush in a certain order. Simple and complicated characters alike follow the same rules of execution: the order of strokes is completed from left to right and from top to bottom; components that enclose other elements are "closed" after the inner ones are completed. Can you guess the order in which the strokes of the above words were written? 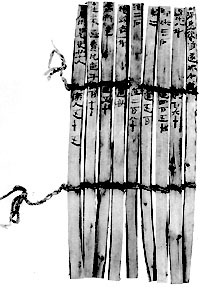 Before the invention of paper, documents were written in vertical columns on strips of bamboo. The strips were then bound together with string. 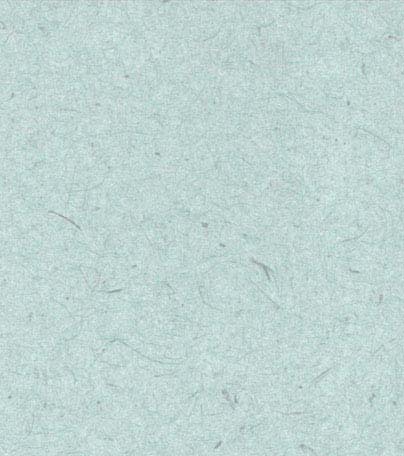 What do you think the challenges were in writing on this type of surface? 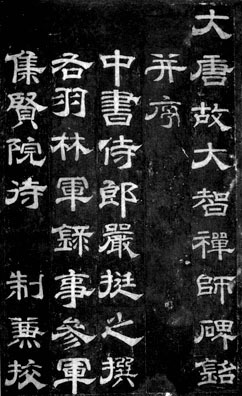 Many different types of regional scripts developed during the Warring States Period as the need for written records increased in state offices that were not centrally controlled. The Qin and Han periods were important for the standardization of script types. Following are four of the major script types used throughout this unit. The seal script, also called smaller seal, is one of the last descendants of the ancient script types used in oracle bone and bronze inscriptions. How do simple and complex characters compare in the example at right? What do you notice about the overall shape of the characters? If you placed an imaginary box around each of them, what shape would it be? Is there a lot of variation in the way the lines (strokes) of the characters look? What kind of writing tool do you think was used to make these characters? Did the tool have a sharp point or a soft one? What makes you think so? 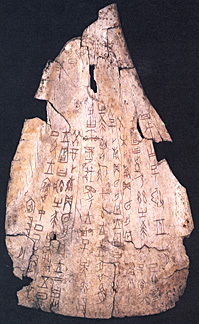 Compare this example with the oracle bone inscription earlier on this page. What are the differences in how the characters are formed and arranged on the writing surface? Clerical script developed from the small seal script in the first century BC, but its peak period of usage was during the Eastern Han (25-220 AD). This script is also referred to by the term "breaking wave," which refers to the outward flaring shape of the right and left downward slanting strokes. (Look for the word that means "big" in the example at left). For what type of documents do you think this script type was used? Compare this example of clerical script with the small seal script, above. What do you think the benefits of this new writing style might have been, especially to someone who wrote in great quantity? Can you identify some strokes in the example above where the tip of the brush is visible? In Chinese writings about calligraphy, much attention is paid to the beginnings and ends of strokes and whether the tip of the brush is visible or not. The expression "hiding the head" refers to the way the calligrapher makes the brush double back on the initial stroke to conceal the entry point where brush first meets paper, while "exposing the tail" refers to the way the calligrapher allows the tip of the brush to show, giving the stroke a pointed end. Script types generally evolved toward forms that were simpler and more expedient. 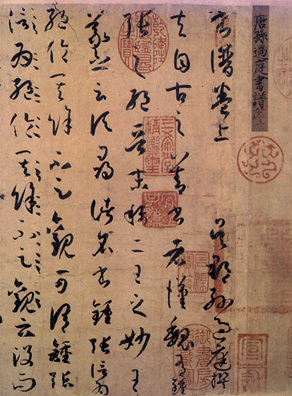 Cursive script, or draft cursive, was widely practiced in the Eastern Han (25-220 AD). What changes in China at this time do you think may have precipitated the development of this script type? In later periods, cursive script was exploited for its expressive, aesthetic potential. From the fourth century onward, cursive was the vehicle in which a master calligrapher could express his or her individuality. It was also used for personal correspondence and non-official writings. 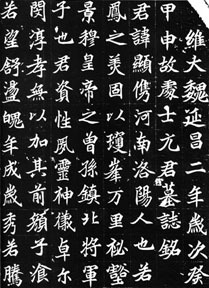 Not everyone was in favor of the abbreviated forms of cursive script; one of the earliest texts about calligraphy still extant from the Han period is a fervent diatribe against the widespread use of draft cursive. Can you recognize any of the characters you've learned? What do you think were the principle advantages and disadvantages of the cursive style? Why was cursive script considered a primary means of individual expression in calligraphy? 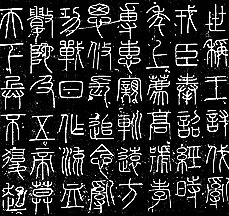 Regular or standard script was the last of the four major types to develop at the end of the Han dynasty. Execution of regular script involves techniques of brush manipulation that were adapted from the other script types. These include an increase in brush movement, hesitations and changes of brush direction as well as variations in the pressure exerted on the brush tip and the speed with which individual strokes were written. Regular script was considered the most legible and convenient form of handwriting. Why do you think the regular script was the last to develop? Is it simpler than the clerical script in execution? In the examples below of clerical (left) and standard/regular (right) scripts, what are the main similarities and differences? Look especially closely at corners and ends of strokes. Does one look as though it were more casually executed?